Maura Gillison, M.D., Ph.D., head and neck medical oncologist and molecular epidemiologist was the first to make the association of human papillomavirus (HPV) and oral cancer. She is the leading expert on HPV and oral cancer. OCF has been privileged to have her as a science advisory board member for over a dozen years, and has been a financial co-sponsor of her work elucidating the role of HPV in the world of oral cancers. Gillison’s work has had, and will continue to have, significant public health implications. In OCF’s view, Dr. Gillison has been insightful, visionary, and with her insatiable scientific drive to find answers, prolific in the body of work produced which has significantly advanced our knowledge of this virus and the disease that it causes. Recruited from Johns Hopkins, she arrived at The Ohio State University Comprehensive Cancer Center – Arthur G. James Cancer Hospital and Richard J. Solove Research Institute in 2009 with NCI R01 funding and has added depth to both the Viral Oncology Program and the Cancer Control Program. In 2017 Dr. Gillison was recruited by MD Anderson Cancer Center Dr. Gillison has made significant research contributions to the fields of tumor virology, cancer biology and epidemiology. 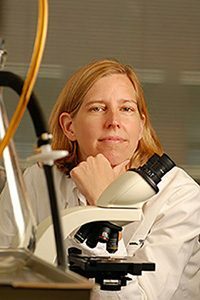 In 2000, she pioneered a study that provided convincing molecular evidence for HPV16 to be the causative agent of a defined subset of oral cavity cancers, which turned out to be a unique disease etiology in many respects, and that it occurred primarily in the posterior of the oral cavity known as the oropharynx. Anatomically this included the base of tongue, tonsils and the oropharynx itself. She was the first to demonstrate that some of these head and neck squamous cell carcinomas (HNSCCs) were HPV(+). She also characterized the HPV types and anatomical tissue localizations favored by the virus. Her findings have confirmed and extended previous molecular and epidemiological studies, and for the first time, demonstrated that HPV(+) HNSCCs comprise a distinct clinical, pathological disease at the molecular level that are causally associated with persistent high risk HPV16 infection. She has followed that work with additional peer reviewed publications that elucidated populations at risk for this disease etiology, mechanisms of transfer of the virus, and much more. Dr. Gillison presented data at the ASCO conference in 2009 showing that HPV is the most important predictor of clinical response to tumor therapy and prognosis for patients with these cancers. As a result of this data, the National Cancer Institute has recommended that all clinical trials involving head and neck cancer be stratified by tumor HPV status. As a result of her work identifying a clear survival advantage to HPV+ cancers, the NCI task force on head and neck cancer has approved moving forward with a de-escalation of therapy clinical trial for “favorable” risk HPV-positive oropharyngeal cancers under RTOG with Drs. Andrew Troti (Moffitt) and Gillison as lead investigators. The objective of this study is to validate decreasing the most harmful portions of the treatments to reduce long-term morbidity of therapy without compromising survival. This will be the first de-intensification trial done for oral/head and neck cancer patients. Head and neck cancer, human papillomavirus, infectious-disease tumor associations. The Gillison laboratory combines the tools of both molecular biology and epidemiology to investigate associations between infectious disease and human tumors. Research to date has focused on the relationship between human papillomavirus (HPV) and head and neck squamous cell carcinoma. The research team has defined the distinct clinical, pathological and molecular characteristics of HPV-associated head and neck cancer; identified the principal risk factors for the disease; validated methods for oral HPV detection; performed proof of concept studies for use of oral HPV detection in oral cancer screening; established tumor HPV status as a major determinant of head and neck cancer prognosis; validated diagnostic methods; and completed HPV-specific therapeutic vaccine trials. The group now leads clinical trials of vaccines for prevention of oral HPV infection, natural history studies of oral HPV infection, population-based surveys of infection, population-based studies of cancer incidence trends over time, and national, clinical trials specific for HPV-associated head and neck cancer. Molecular studies now focus on predictors of response to treatment. The laboratory also has ongoing studies investigating other, possible infectious disease-tumor associations. The principal focus of Dr. Gillison and her laboratory has been until recently to investigate the role of human papillomavirus infection in head and neck malignancies, from cohort studies of oral HPV infection, to genetic indicators of response to chemoradiotherapy. Additionally, Gillison established the gold standard of HPV diagnostic tests, currently in use within clinics nationwide; work which was funded by the Oral Cancer Foundation, and done in collaboration with another OCF science advisory board member, Dr. Mark Lingen, at the University of Illinois, Chicago. Her current work is in the field of immuno therapeutics and she was a lead researcher on the Checkmate 141 trial that brought the drug nivolumab to the world of head and neck cancer treatment. OCF was a financial contributor to that pivotal trial as well. Today that drug is extending lives that previously because of their advanced nature, either failing primary treatment or in a recurrence, had little hope.